Four characters in search of the Author of life. The martyrdom of John, with the crude and bleak image of the disciples who go to take his body in his cell to give him a burial, suggested to the Pope - at the Mass celebrated on Friday 8 February in Santa Marta - an appeal to know how to give one's existence to others. And not to fall into that corruption, between hatred and vanity, of which Satan had wrapped King Herod, Herodias and his daughter. "The disciples of John, having learned of the fact, came and took the corpse and placed it in a sepulcher." It is with these words - taken from the passage of the Gospel of Mark (6, 14-29) - that, as pointed out by Francis at the beginning of his homily, «ended the story of this man to whom Jesus had given the title of" greatest man born as a woman "». So, "the greatest ended like this". «But John - the Pontiff insisted - knew this, he knew he had to annihilate himself, he did not know how he would die, but he knew he had to annihilate himself». And "from the beginning he had said it, speaking of Jesus:" He must grow, but I should diminish "». In fact, he explained, Giovanni "has decreased to death. He was the forerunner of the coming of Jesus, the announcer: he showed it to the disciples, to the first disciples ». And "then his light had gone out little by little, little by little, to the dark of that cell, in the prison, where, alone, he was beheaded." «This is the story of the" greatest man born of a woman "» the Pope re-launched, pointing out that «the life of martyrs is not easy to tell: martyrdom is a service, it is a mystery, it is a gift of life very special and very big ». And "in the end things happen violently, because in the middle there are human attitudes that lead to take away the life of a Christian, of an honest person, and to make him a martyr". In particular, Francis indicated "some attitudes in this passage of the Gospel" proposed by the liturgy. And "the first is the attitude of the king: it is said that he believed that John was a prophet. He believed, he listened willingly; at one point he protected him, but he had put him in jail: half and half ". He was "undecided, because John rebuked the king for the sin of adultery and he remained very perplexed when he heard it: he felt the voice of God telling him" change life ", but he could not do it». In short, the Pontiff affirmed, "the king was corrupt and where there is corruption it is very difficult to get out". Precisely because "corrupt", the king "tried to make diplomatic balances, let's say, between his own life - not only adultery, but also the life full of so many injustices that this king carried out - and the holiness of the prophet who had ». And "this was the perplexity, and never came to melt that knot". Therefore, "the first protagonist of this ending is a corrupt". "The second protagonist is the wife of the king's brother, Erodìade," the Pope continued. Only of her "the Gospel says that" he hated "John" and "hated him because John spoke clearly". Francis was careful to point out the word "hated" because "we know that hate is capable of everything, it is a great force. Hatred is the breath of satan: let's remember that he can not love, Satan can not love, can not love. His "love" is hate ". And "this woman had the satanic spirit of hatred" and "hatred destroys". "The third character - the Pope said - is the girl, the daughter of Herodias: she was good at dancing, to the point that it pleased so much the guests, the king". And "the king, in that enthusiasm - a bit of enthusiasm, too much wine and lots of people there - gave this vain girl a promise:" I will give you everything "». 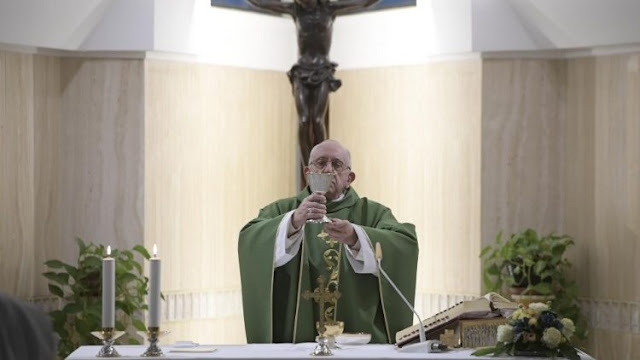 The Pope pointed out that "he uses the same words that he used Satan to tempt Jesus:" If you worship me I will give you everything, all the kingdom, everything "». Nor did he "know that he used the same words". Because "behind these characters there is satan, sower of hatred in the woman, sower of vanity in the girl, sower of corruption in the king". In this context the "greatest man born as a woman" ended up alone, in a dark cell of the prison, on the whim of a vain dancer, the hatred of a diabolical woman and the corruption of an undecided king ". John is "a martyr who let his life be less, less, less, to give place to the Messiah". And «he died there, in anonymity, like so many of our martyrs». So much so that "only the Gospel tells us that the disciples went to take the body to give it burial". "Each of us can think: this testimony is a great testimony of a great man, of a great saint," said the Pontiff. "Life - he pointed out - has value only in giving it, in giving it in love, in truth, in giving it to others, in daily life, in the family". But "always give it". And "if someone takes life for himself, to guard it, like the king in his corruption or the lady with hatred, or the girl, the girl, with her own vanity - a little adolescent, unconscious - life dies, life ends withered, no use ". On the contrary, John "gave his life:" I, on the contrary, must diminish so that He may be heard, be seen, so that He may manifest himself, the Lord "». In conclusion, Francis suggested "to remember four characters: the corrupt king, the lady who only knew how to hate, the vain girl who has no conscience of nothing and the prophet beheaded only in the cell." With the hope that "everyone will open their hearts so that the Lord will speak to him about this".